Census Edict for Roman Egypt at K.C. Hanson's website. Includes study questions and a bibliography. Exegetical Fragments, Hippolytus of Rome (c 210). Book I, Chapter 5, Ecclesiastical History, Eusebius of Caesarea, (c. 320). Sermon XXI, Sermon XXII, Sermon XXIII, Sermon XXIV, Sermon XXVI, Sermon XXVII, and Sermon XXVIII on the Nativity of the Lord, by Leo the Great (400-461). "The Birth of Jesus and the Angels' Song," Luke 2:1-14, Martin Luther, c. 1521. Commentary on a Harmony of the Evangelists, John Calvin: Luke 2:1-7, Luke 2:8-14, Luke 2:15-21, 1558. "Whole armies of angels, who compass the majesty of God round about, just as soldiers, as it were." "Peace is here put for all that good which flows to us from Christ's taking our nature upon him." "Mary seems not to have known that the child must have been born in Bethlehem, agreeably to the prophecy. But the providence of God took care for it." "The First Christmas Carol," Luke 2:14, Charles H. Spurgeon, 1858. "Although it would be a high sin, and an act of misdemeanor against the Sovereign Court of Heaven to pay the slightest adoration to the mightiest angel, yet it would be unkind and unseemly, if we did not give to holy angels a place in our heart's warmest love." "first . . . when Cyrenius, &c.--a very perplexing verse, inasmuch as Cyrenius, or Quirinus, appears not to have been governor of Syria for about ten years after the birth of Christ, and the "taxing" under his administration was what led to the insurrection mentioned in Ac 5:37. That there was a taxing, however, of the whole Roman Empire under Augustus, is now admitted by all...Many superior scholars would render the words thus, "This registration was previous to Cyrenius being governor of Syria"--as the word "first" is rendered in Joh 1:15; 15:18...But it is perhaps better to suppose, with others, that the registration may have been ordered with a view to the taxation, about the time of our Lord's birth, though the taxing itself--an obnoxious measure in Palestine--was not carried out till the time of Quirinus." "When the Lord stooped from Divine glory to take upon him humanity, he stooped to its most lowly estate. An Oriental inn is thus described: 'The khan is usually much on the model of the Eastern house, but of much larger extent. Four rows of apartments are so constructed as to enclose a large yard with a well in the center where the cattle may be kept. The outer wall is usually of brick upon a stone basement. The apartments are entered by the guests from the yard, and are elevated two or three feet above the level of the yard. Below and behind the row of the travelers' apartments was often the row or the long room of stables, into which the floors of the apartments being a little extended, formed a platform upon which the camels could eat.'" What Christmas Eve Is For, Janet H. Hunt, Dancing with the Word, 2014. "Have you ever spent Christmas in an unexpected way? How was it in keeping with the first Christmas?" Commentary, Luke 2:1-14 [15-20], Karyn Wiseman, Preaching This Week, WorkingPreacher.org, 2013. "Ask any parent or grandparent about the birth of a new baby and they typically can describe the event in great detail." Commentary, Luke 2:[1-7] 8-20, Richard Swanson, Preaching This Week, WorkingPreacher.org, 2013. "This scene opens with Roman trumpets blaring an imperial order coming from Caesar Augustus when Quirinius was governor of Syria." "Christmas in the Barn," Janet H. Hunt, Dancing with the Word, 2013. "As you consider where Jesus might be born today, what possibilities come to mind? What elements or characteristics of the first Christmas story would you take into account as you think about this?" Commentary, Luke 2:1-14 [15-20], Craig A. Satterlee, Preaching This Week, WorkingPreacher.org, 2012. "Jesus is being born where people need him the most." "The Face in the Sky," "The Innkeeper," "The Shepherd," Frederick Buechner, Buechner Blog. "Caesar Augustus," from Beyond Words. "But what of those who both believe and do not believe, cannot believe - which is some people all of the time and all people some of the time?" "Stolen Baby Jesus," the Rev. Dr. Janet H. Hunt, Dancing with the Word, 2012. "What and where is your favorite manger scene? Which figure(s) capture(s) the story for you this year?" Comentario del Evangelio por Iris Barrientos, Lucas 2:1-14, (15-20), Working Preacher, 2012. Commentary, Luke 2:1-14 [15-20] / Luke 2[1-7] 8-20, Joy Moore, Preaching This Week, WorkingPreacher.org, 2011. "This holiday familiarity is a particular problem for preachers. We must keep in mind that for some, the Christmas story has been regularly heard since childhood. And yet, these annual rehearsals have failed to reveal to contemporary audiences the jarring display of ancient culture the episode describes." "Something More," David Lose, Dear Working Preacher, 2011. "We desperately want a sense of meaning and purpose, we desire to believe that there is more to this life than meets the eye, we need to hold onto the hope that despite all appearances we are worthy of love." The Story of Jesus' Birth, audio telling, story in episodes, graphic, audio and written commentaries. Go Tell Communications, Biblical Storytelling for the Global Village, 2011. "The 'Real' War on Christmas?" Eric Barreto, ON Scripture, Odyssey Network, 2011. "I think many Christians would be surprised at some of the forgotten details that end up on the cutting room floor of a Christmas pageant, those features of the narrative crowded out of a creche full of various animals and wise men." "Luke was not writing history. He was writing theology in narrative form, which is much more important and much more interesting." "The Nativity in Art," pdf study guide, Robert B. Kruschwitz, (other resources at) "Christmas and Epiphany Library," Christian Reflection, The Center for Christian Ethics at Baylor University, 2011. Focus articles: "The Magi's Adoration," by Heidi J. Hornik, on Gentile da Fabriano's, Adoration of the Magi, "The Shepherds' Adoration," by Heidi J. Hornik and Mikeal C. Parsons, on Domenico Ghirlandaio's Adoration of the Shepherds and Hugo van der Goes' Adoration of the Shepherds. "First Thoughts on Year B Gospel Passages from the Lectionary," Christmas Day, William Loader, Murdoch University, Uniting Church in Australia. "In moments of our own deeper truth we can also find ourselves facing our raw humanity, facing our own poverty, stripped of our shining garments and clad in just the basics. Then the angels are there for us." Commentary, Luke 2:1-14 [15-20], David Tiede, Preaching This Week, WorkingPreacher.org, 2008. "Thus is born the true savior of the world--not Caesar Augustus, the oppressor, false savior of the world, protector of those with power and privilege, but Christ the Lord, whose birth is "good news of great joy for all the people." Holy Textures, Understanding the Bible in its own time and in ours, Luke 2:1-20, David Ewart, 2010. "Nonetheless, it is to these unlikely and unworthy shepherds that the first news of the birth of Jesus is given, and not to the Kings, Caesars, and Governors mentioned at the beginning of this passage." "God in Particular," Kyle Childress, The Ekklesia Project, 2009. "The God we worship comes to us in the particularity of this Jesus and in the specifics of his life embodied where we live." "Registered among Sinners," Bruce T. Martin, Sabbatheology, The Crossings Community, 2009. "It is true that our new life of faith cannot yet be fully appreciated, despite our 'great joy,' for we continue to be sinners among other sinners; nonetheless it is exactly among other sinners (in Lucan words, to be "registered" among them as Christ is for us) where we need to be in order to exercise our Spirited faith and freedom through proclamation and through love." "First Thoughts on Year C Gospel Passages in the Lectionary," Christmas Day, William Loader, Murdoch University, Uniting Church in Australia. "Faithfulness to the tradition entails ensuring its marking stones are not displaced and clearing the space for what is profound ceremony." Commentary, Luke 2:[1-7] 8-20, David Tiede, Preaching This Week, WorkingPreacher.org, 2008. Luke 2:(1-7), 8-20, Christmas, Comments (commentary) and Clippings (technical notes for in-depth study), Chris Haslam, Anglican Diocese of Montreal. Luke 2:1-7, (8-20), Christmas, Comments (commentary) and Clippings (technical notes for in-depth study), Chris Haslam, Anglican Diocese of Montreal. "First Thoughts on Year A Gospel Passages in the Lectionary," Christmas Day, William Loader, Murdoch University, Uniting Church in Australia. Celebration! Tell the story. Its simplicity invites drama, poetry, pageant." "Whose Story Would You Rather Believe?" Paul Bellan-Boyer, City Called Heaven, 2009. "If it were up to Caesar, you would never hear the baby's story. Nothing in it is exalted." "Christmas," Gospel Analysis, Sermons from Seattle, Pastor Edward F. Markquart, Grace Lutheran Church, Seattle, Washington. Detailed background and exegesis. Commentary, Luke 2:1-7, Kirk Byron Jones, The African American Lectionary Commentary, 2008. "In the undying spirit of a single child born over two thousand years ago, celebrating his birth calls us to a celebration of ourselves as God?s children." "Time," Listening to the Text, Engaging the Text, and Preaching the Text, Dr. Dwight Gunter, Preacher's Magazine, 2007. "This passage sets itself up to address the conflicts that arise in people?s lives as they try to make sense of events over which they have no control." "Joy," Listening to the Text, Engaging the Text, and Preaching the Text, Dr. Dwight Gunter, Preacher's Magazine, 2007. "We, too, must take a risk and experience the birth of Jesus in us. This occurs not only on an individual level, but also on a corporate level." "Afterword: The Lucan Texts for the Christmas Season," The Birth of Jesus Never Saved Anyone: The Lucan Advent Texts, Marc Kolden, Word & World: Theology for Christian Ministry, Luther Northwestern Theological School, 1991. "Event, Revelation, Reaction," Larry Broding's Word-Sunday.Com: A Catholic Resource for This Sunday's Gospel. Adult Study, Children's Story, Family Activity, Support Materials. "Is Christmas day a time of rejoicing (the Christ is born to us)? Or a time of relief (Christmas is finally over)?" "...how can Christmas as a Celebration of Disruption get through our celebration of cosiness? Ponder all these things in our hearts? What cycles of ours does God want to break into, break us out of, so that we bring to birth whatever it is God needs in our case?" "Today the Savior Is Born," "Fear Not," Rev. Bryan Findlayson, Lectionary Bible Studies and Sermons, Pumpkin Cottage Ministry Resources. Includes detailed textual notes. "Extraordinary News to Ordinary People: Verse Commentary on Luke 2:8-20," Jirair Tashjian, at The Christian Resource Institute. "Luke is fond of the word today and uses it repeatedly to mean the present period of salvation brought about by Jesus (4:21; 5:26). Salvation is not something to be expected only in the future at the second coming of Jesus or in heaven after death. It can be experienced here and now. "Today salvation has come to this house," says Jesus to Zacchaeus (Luke 19:9)." "Acclamations of the Birth of Christ: Luke 2:1-20," J. Hampton Keathley III, Biblical Studies Foundation. "The shepherds went back to their sheep, to their occupations, and undoubtedly also to their families, but they went back changed men." Environmental & earth-centered reflection, Rev John Gibbs, from the Episcopal Diocese of Minnesota Environmental Stewardship Commission. "Christmas and Luke's Theology of Hope," Vernard Eller, The Christian Century, December 18, 1968. "The ultimate promise (better, the promise of the ultimate) is eschatological in the strict sense of that term; it is the promise of that which is final (in that there is nothing greater that could be promised) and universal (extending to all men and even to the rest of creation). It is the promise of the Kingdom of God, of making man, true and all things new, of God's will being done on earth as it is in heaven." "Octavian ushered in the Pax Romana, but the cost of this peace was the surrender of the human liberties of the republic. Roman citizenship became little more than political and social slavery. For Caesar--Caesar Augustus--was supreme despot, chief dictator, totalitarian lord of all he surveyed." Luke 2:1-7, Saint Mary the Virgin, Comments (commentary) and Clippings (technical notes for in-depth study), Chris Haslam, Anglican Diocese of Montreal. "The Manger and the Inn," Kenneth Bailey, PhD, Associates for Biblical Research, 2008. "Census of Quirinius," "Nativity of Jesus," "Adoration of the Shepherds," wikipedia. "Living in the Shadow of the Manger," Margaret Eletta Guider, O.S.F., (other resources at) "Children," Christian Reflection, The Center for Christian Ethics at Baylor University, 2003. "When the shadow of the Manger falls across our lives with a power similar to the shadow of the Cross, we will commit ourselves to respond to the particular needs and suffering of children." "God as Suffering Parent," Fredrica Mathewes-Green. beliefnet. "If there was once grand mystery around the Incarnation, it has long since dispersed. Three jolly bears now convey everything we know or expect to know. It is a scene is plump with stupidity. Jesus as a cookie. God as a pet." "Bethlehem: Jesus' Birth," Terry C. Hulbert, Walking in their Sandals. "Jesus was not born in a manger or a stable, as we know it, but in the home of a member of the family of Joseph and Mary who lived in Bethlehem. Common misconceptions of the circumstances of His birth result from a mistranslation of kataluma which means "guest room," not "inn," and from a Western rather than a Middle Eastern understanding of the cultural factors involved." Borg, Marcus, "When Heaven and Earth Meet," The Living Pulpit, 1996. Boyce, James L., "For You Today a Savior: The Lukan Infancy Narrative," Word & World, 2007. Brindle, Wayne, "The Census and Quirinius: Luke 2:2," Journal of the Evangelical Theological Society, 1984. Brown, Rosalind, "Go Out in Joy," The Christian Century, 1998. Burchard, Christoph, "A Note on RHMA in Josas 17:1f; Luke 2:15, 17; Acts 10:37," Novum Testamentum, 1985. Burghardt, William, S.J., "Gospel Joy, Christian Joy," The Living Pulpit, 1996. Carl, William J., Jr., "Reflections on Joy," The Living Pulpit, 1996. Conrad, Edgar W., "The Annunciation of Birth and the Birth of the Messiah," The Catholic Biblical Quarterly, 1985. Derrett, J. Duncan M., "Further Light on the Narratives of the Nativity," Novum Testamentum, 1975. Gaventa, Beverly R. and John Dominic Crossan, "The Challenge of Christmas: Two Views," The Christian Century, 1993. Giblin, Charles H., S.J., "Reflections on the Sign of the Manger," The Catholic Biblical Quarterly, 1967. Globe, Alexander, "Some Doctrinal Variants in Matthew 1 and Luke 2, and the Authority of the Neutral Text," The Catholic Biblical Quarterly, 1980. Green, Joel B., "Good News of Great Joy - But for Whom?" The Living Pulpit, 2002. Jegen, Carol Frances, "Rejoicing in God," The Living Pulpit, 1996. Kolden, Marc, "The Birth of Jesus Never Saved Anyone: The Lucan Advent Texts," Word & World, 1991. Meyer, Ben F., S.J., "'But Mary Kept All These Things...' (Luke 2:19, 51)," The Catholic Biblical Quarterly, 1964. Meyer, Paul, "Free Flowing Reflections on Luke 2:1-20 from a First Century Perspective," Currents in Theology and Mission, 1980. Moore-Keish, Martha L., "Between Text & Sermon: Luke 2:1-14," Martha L., Moore-Keish, Interpretation, 2006. Norris, Kathleen, "Zealous Hopes," The Christian Century, 2005. Pearson, Brook W.R., "The Lucan Censuses, Revisited," The Catholic Biblical Quarterly, 1999. Read, David H.C., "Communicating Joy," The Living Pulpit, 1996. Ruddick, C.T., Jr., "Birth Narratives in Genesis and Luke," Novum Testamentum, 1970. Schmemann, Fr Alexander, "The Proclamation of Joy: An Orthodox View," The Living Pulpit, 1996. Silberman, Lou H., "A Model for the Lukan Infancy Narratives?" Journal of Biblical Literature, 1994. Smith, Mark D., "Of Jesus and Quirinius," The Catholic Biblical Quarterly, 2000. Smith, Robert, "Caesar's Decree (Luke 2:1-2): Puzzle or Key?" Currents in Theology and Mission, 1980. Tyson, Joseph B., "The Birth Narratives and the Beginning of Luke's Gospel," Semeia, 1991. Verbrugge, Verlyn D., "The Heavenly Army on the Fields of Bethlehem," Calvin Theological Journal, 2008. Wegener, Mark I., "Between Text and Sermon: Luke 2:1-20," Interpretation, 1994. "Look to the Child," Rev. John Philip Newell, Day 1, 2011. "Time," Dr. Dwight Gunter, Preacher's Magazine, 2007. "Joy," Dr. Dwight Gunter, Preacher's Magazine, 2007. "Raining Joy," Grace Imathiue, Day 1, 2007. "Jesus, Our Hope," Darrik Acre, Preacher's Magazine, 2005. "Gloria!" Pastor Edward F. Markquart, Grace Lutheran Church, Seattle, Washington. "Recognizing Jesus," Stanley Hauerwas, Faith and Leadership, 2012. "Jesus' Birth," "The Shepherds Worship Jesus," Illustrating the Story (lessons, children's sermons), coloring pages, activity sheets, crafts, children's songs. MSSS Crafts. "A Child Is Born," Jim Kerlin, childrensermons.com. "The Birth of Jesus," "Angels Appear to Shepherds," children's study, puzzles, coloring sheet, etc. Higher Praise Christian Center. "Chosen One," Judy Grubb, sermons4kids.com. "The Birth of Jesus," online computer java-based coloring pages from Grace Baptist Church of Feeding Hill. "The Innkeeper's Wife," Nina Wallestad, Dramatic License. Conditions of Use. "Lamb of God," Nina Wallestad, Dramatic License. Conditions of Use. Images for this week's readings, Nativity/Shepherds, Pitts Theology Library Digital Image Archive. Luke 2:7, Luke 2:9-10, Luke 2:9-10, Luke 2:14, Heartlight - Free Christian PowerPoint Backgrounds. 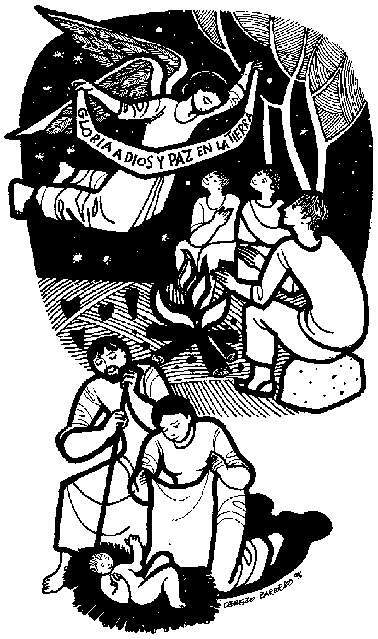 Luke 2:1-20, at Cerezo Barredo's weekly gospel illustration. Liberation emphasis. "Born in a Manger," Henry Martin, sermons4kids.com. “When Mary Hugged Her Newborn Son,” an original hymn by Carolyn Winfrey Gillette, celebrates Mary, the Shepherds and the Wise Men and asks "God, make us faithful, humble, wise, To know that Jesus changes lives.". This hymn was commissioned by The Presbyterian Outlook Tune: TALLIS' CANON (8.8.8.8) (All Praise to Thee, My God, This Night). “O God, Your Grace Has Now Appeared,” an original hymn by Carolyn Winfrey Gillette, based on the Christmas stories calls for us to find “Your grace that calls us to respond â€”To live as we've been blessed. This hymn was commissioned by The Presbyterian Outlook Tune: WINCHESTER OLD 8.6.8.6 (“While Shepherds Watch Their Flocks”). "In a Feedbox, In a Stable,” an original hymn by Carolyn Winfrey Gillette, based on the Christmas stories and God being in a suffering world today, published in Princeton Seminary’s inSpire magazine. Tune: BEECHER 8.7.8.7 D (“Love Divine, All Loves Excelling”). "What a World of Sound,” an original hymn by Carolyn Winfrey Gillette, based on the Christmas stories, recognizing it might not been a “Silent Night.” Tune: HYMN TO JOY 8.7.8.7 D (“Joyful, Joyful, We Adore Thee”). “Fear Not!" the Angel Said,” an original hymn by Carolyn Winfrey Gillette, based on the Christmas stories reminds us that we do not need to be afraid for God is with us, posted on the Church World Service web site. Tune: TERRA BEATA 6.6.8.6 D (“This is My Father's World”). Hymns with Scripture Allusions: Luke 2:1, 6, 7, 8, 9, 10, 11, 13, 14, 15, 20. The Cyber Hymnal. "On the Hillside: Perspectives of a Bethlehem Sheep," by William R.G. Loader, Murdoch University, Australia. "Nativity," from La Corona by John Donne (1572-1631). "Christ Climbed Down," Lawrence Ferlinghetti, 1958. Theology Today.